I’ve been encouraged by some of the feedback I’ve had about the Sunday morning series that’s just come to an end. It’s the first time I’ve preached a series on “the Five Points”. I have preached several series going through all the great doctrines of the Bible. But I’ve never wanted to pick out the five points particularly. Partly, that’s because I’m aware that some folk have emphasised them in an unhelpful way. They’ve talked as if the five points are the most important truths for any believer to grasp. At times they’ve given the impression that anyone who has grasped these truths has reached a pinnacle of Christian understanding. To be a “five pointer” is to have achieved spiritual maturity! I don’t believe that. The five points are a great summary of what the Bible has to say about the way God saves human beings. But the five points are not the starting point in understanding and worshipping God. Believers should be more interested in God himself than in what he does for us. God is worthy to be praised because of who he is: one God in three persons, “infinite, eternal and unchangeable in his being, wisdom, power, holiness, justice, goodness and truth”. If I were asked which is the most important doctrine for Christians to believe, I would say unhesitatingly, the doctrine of the Trinity: that doctrine underlies all other Christian doctrines, including the doctrines of salvation. I would prefer to hear believers praising God joyfully for the love that has existed eternally between the three persons, than for the mercy we have received from him. Isolating the five points from the whole biblical presentation of God’s being can be dangerous. And yet the five points are important. They do give us a clear and systematic overview of what the Bible says about God’s plan of salvation. And a number of you have said how helpful it’s been to hear the plan of salvation presented in this systematic way. How did the five points come to be formulated in the first place? By a strange and wonderful providence of God. We only have that five-point outline because of the attempts of false teachers to undermine the teaching of God’s Word. By God’s overruling, their attacks on the truth led to this wonderfully clear summary of the Bible’s teaching on God’s plan of salvation. 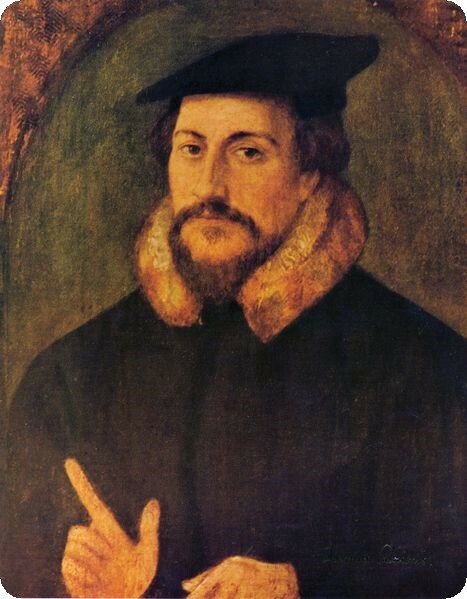 Many people assume that it was Calvin who first listed out the five points (they’re often labelled “the five points of Calvinism”). But it was not Calvin who first drew up this 5-point presentation. I have mentioned several times over recent weeks that the five points were first drawn up at a great conference of preachers and theologians held in the Dutch city of Dort in 1618/19. That conference was called to answer a group of false teachers who were spreading their unbiblical ideas into the Reformed churches of the Netherlands. The false teachers drew up a list of five issues that they wanted discussed. The church leaders who had gathered took those issues one by one and answered them under five headings. And Bible-believing Christians have been using those headings ever since. We call the false teachers Arminians. They were followers of Jacobus Arminius, a Dutch minister who was appointed as professor of theology at Leiden University in 1603. 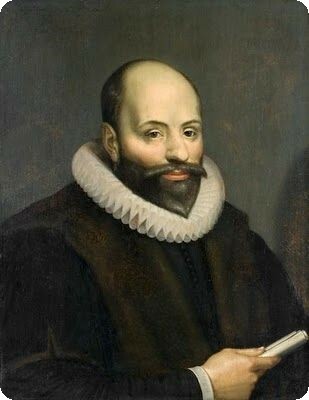 As a minister in the Reformed church, Arminius had vowed to uphold the teaching of the Belgic Confession and the Heidelberg Catechism – these were the two documents that summarised the teaching of the Reformed Churches of the Netherlands. But Arminius had come to doubt what those documents teach about God’s plan of salvation. Those who listened to him preach began to suspect that secretly he had turned away from the teaching of the Bible and the churches. But he denied it. When he was invited to become professor at Leiden, again he vowed that he would be faithful to the Confession and the Catechism. He did not keep that vow. Rather he used his position to spread the false doctrines that he had come to believe. He did it in subtle ways, trying to hide just how far he had moved from the truths he had been appointed to teach. But through his influence, many of the students who listened to his lectures were persuaded to turn away from the teaching of the Bible, and of the reformed churches. As Arminius’s real position became clearer, God raised up men with the ability and determination to oppose him. But he was allowed to carry on teaching at Leiden, and spreading his ideas. It was not until 1608 that he came out into the open and admitted that he he wanted to see the Confession and the Catechism revised, to accomodate his unorthodox teaching about predestination. Arminius died in 1610. But he left behind him a circle of theologians and ministers who had been persuaded by his arguments – and were prepared to take them further. Their most outstanding leader was Simon Episcopius who followed Arminius as professor at Leiden in 1613. Where Arminius had put forward his ideas cautiously and privately, Episcopius and his friends were prepared to argue more confidently for those ideas – and to advance even more radical and unbiblical ideas. The years that followed were years of bitter controversy. After Arminius’s death his followers presented a “Remonstrance” to the civil authorities of the Netherlands. In this document, they laid out under five headings the views they believed. They argued that the Confession and the Catechism should be revised to allow for their teachings. And they argued that the churches should be forced to accept that their views were a valid alternative to the orthodox position. In the following year, a conference was held between the Remonstrants – as they came to be known – and the defenders of the orthodox teaching – sometimes labelled the “counter-Remonstrants”. The counter-Remonstrants answered the Arminians’ arguments carefully, showing from the Bible that God has indeed planned salvation, that he chose eternally and unconditionally those who will be saved, that through Christ he does everything needed to guarantee their salvation. The Arminians were not convinced, and the battles continued. The orthodox party in the Church were eager to hold a national Synod – a gathering of representatives from all the churches, to discuss and settle the questions the Arminians had raised. The Arminians were determined to avoid such a confrontation. They knew that in open debate, their real positions would be exposed. And they knew that they could not defend them from the Bible. It was not until November 1618 that a Synod gathered at Dort. 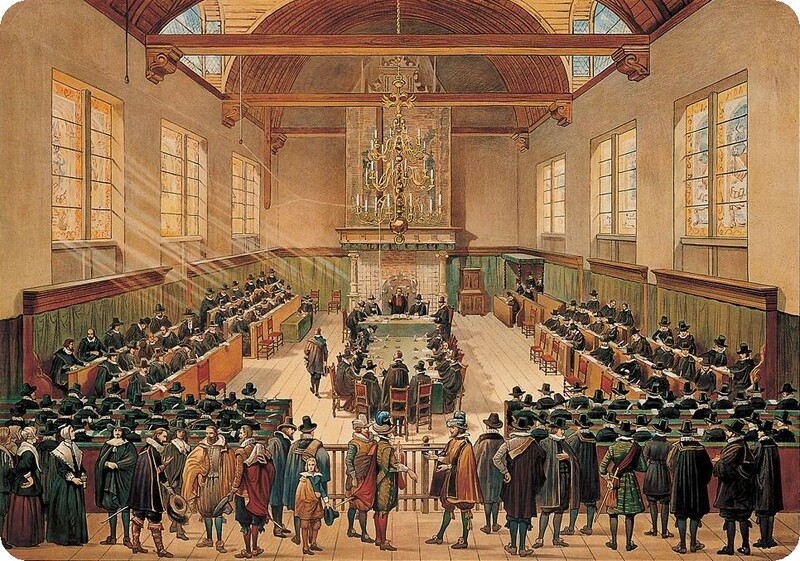 Eighty-four Dutch preachers and theologians were present along with eighteen observers appointed by the government. Representatives came too from reformed churches across Europe (including some from England). The synod met for six months, and included one hundred and fifty-four official sessions as well as many less formal discussions. Episcopius and twelve of his Arminian friends were summoned to attend. They were reluctant to come unless they were allowed to set the agenda and dictate the procedure to be followed. But the civil authorities insisted that they must attend and present their views for examination. Reluctantly they set out their views, again under five headings. What did these Arminians believe? The first issue they raised concerned the doctrine of predestination. The Arminians believed that God elected those whom he foresaw would believe in Christ and persevere. “The election of particular persons is decisive, out of consideration of faith in Christ Jesus, and of perseverance… as a condition prerequisite for electing”. The third dealt with the grace of God. The Arminians agreed that fallen human beings are incapable of saving themselves without God’s help. “He is able of himself, and by himself neither to think, will or do any good (which would indeed be saving good, the most prominent of which is saving faith…” They agreed that God has to supply grace to sinners before they can believe – but then they added, “yet man is able of himself to despise that grace and not to believe…” According to the Arminians, God gives grace to everyone who hears the Word, “sufficient for promoting conversion…” but whether it actually leads to conversion depends in the end on the hearer’s own decision. The sinner has something in himself which can choose to co-operate with God’s grace. The fourth dealt with the conversion of man. The Arminians rejected the idea that God calls sinners to himself with an irresistible call, making them willing to repent and believe. They talked about effective – “efficacious” grace, but then they said it might not be effective, because it could be resisted. “The efficacious grace by which anyone is converted is not irresistible”. 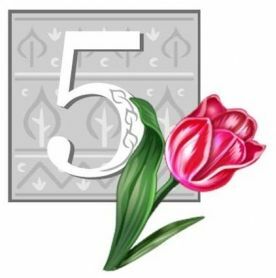 The fifth dealt with perseverance. The Arminians taught that believers may forfeit their salvation. “True believers are able to fall through their own fault into shameful and atrocious deeds, to persevere and die in them, and therefore finally, to fall and to perish”. Well, if you have listened through this series of sermons, you know what the Bible has to say on all these matters, and how the men who gathered at Dort answered the Arminians. The statement they drew up (The Canons of Dort) is a wonderful and comprehensive statement of the Bible’s teaching on human sin and God’s gracious plan of redemption. It runs to thirty-two pages in the edition I’m using and is packed with Scripture. Let me just give you a taster. Those are the five points! For my series, I gave them the headings, Unconditional Election; Particular Redemption; Total Depravity; Effectual Calling; Perseverance of the Saints. And like most Bible preachers nowadays, I chose to deal with the third point first (the Synod linked together the discussion of points 3 and 4). But the truths I preached were exactly the truths that were hammered out at Dort four hundred years ago. The result of the Synod? The Arminian ministers were dismissed from their pulpits; the Arminian professors were dismissed from the positions they had held. Indeed, the civil authorities made it their business to send them into exile. I can’t pretend I think that was right. I don’t believe it’s the business of the government to judge or punish false teaching in the church. But I applaud the willingness of the churches to discipline false teachers who sought to undermine the gospel of grace. Of course, the Arminians did not give up the battle. They used every means they could to continue to spread their false teaching. Some remained evangelical, still teaching that man is sinful and needs to be saved. (John Wesley, a hundred and twenty years later, was not afraid to call himself an Arminian). But others moved further and further from the Bible’s teaching. Many Arminians finished up denying that God knows the future, that human beings have been corrupted by Adam’s sin, that Christ’s death truly atoned for human guilt. Indeed some questioned the doctrines of the Trinity and the deity of Christ. But at least the reformed churches of the Netherlands had been rescued from the false teaching that Arminius and his followers had attempted to bring in. There are many lessons we should learn from the battle that faithful men had to fight against the false teaching of Arminianism back in the seventeenth century. The methods the Arminians used are no different from the methods that false teachers have always used, and still do. Let me list some of them – and of course, there’ll be five in my list! (1) The false teachers were unfaithful to the vows they had taken. The Arminian leaders had all sworn to be faithful to the doctrines of the Belgic Confession and the Heidelberg Catechism. They were appointed as preachers and pastors on that understanding. Some changed their views after they had been appointed. But when they found that they no longer believed the truths they had sworn to uphold, they did not resign. Instead they used their positions to undermine those truths. Others were more deceitful yet. They made their vows knowing that they did not believe the teaching of the Confession and the Catechism, but hoping that they could persuade the Church to change its stance. Could the same thing happen today? It happens again and again. Pastors change their views but cling to their positions. I can think of pastors serving in churches that are committed to the 1689 Confession. That confession teaches clearly that the revelation gifts of New Testament times – tongues, prophecy, etc – have passed away. When these pastors were appointed they held that view. But now they’ve changed their minds. Yet they have not resigned. Week after week they break their vows. I know too of churches which have called a man only to discover later that he has never believed the truths he swore to uphold. A church I know well, committed to the 1689 Confession, was on the point of calling a man, when at the last moment it became clear that he did not believe the doctrine of particular redemption. He had kept that fact hidden. (2) The false teachers used words in deceitful ways. When undiscerning listeners heard the Arminians speak, they heard familiar words and were reassured. What they didn’t realise was that the Arminians were using those words in misleading ways. The Arminians talked about efficacious grace. But they didn’t mean what everyone else meant by those words – grace that actually brings about infallibly the salvation of sinners. They used the words to mean grace that could bring a person to salvation if he responded to it rightly. They talked about Christ’s death as propitiation. But they didn’t mean what the Bible means by propitiation – a sacrifice that actually turns away God’s wrath from those for whom it’s made. They meant only that it opened the way for a sinner to be saved from God’s wrath – providing that he played his part in repentance and faith. They talked about election, but they didn’t mean what all the Confessions meant by election – God choosing particular people to save. They meant only that God had chosen to save a class of people – those who he foresaw would repent and believe. It took very persistent questioning to force the Arminians into the open and to make clear the real meaning of their words. False teachers still use the same way of disguising what they’re saying. Take a word like “infallible”. If you heard someone say that the Bible is “infallible”, what would you think they meant? You might think they’re saying that the Bible is true in all it teaches. That’s the way the word has always been used by Christians. But no! Nowadays there are many theologians who want to use the word in a different way. When they say the Bible is infallible what they mean is that it is true in what it says about “spiritual” matters – but that it can be full of historical, chronological or scientific errors. It’s not enough to ask whether preachers and theologians are using orthodox words. We have to ask what they mean by those words. (3) The false teachers presented themselves as the moderates, and their views as the centre-ground. They pointed on the one hand to ‘Pelagians’ – people who taught that man was capable of saving himself without any help from God. Pelagians, they suggested, stand at one extreme. They pointed on the other hand to the orthodox Christians who held to the Bible truth that salvation is God’s work alone. Such Christians, they suggested, stand at the opposite extreme. And thus they could present themselves as the moderates who avoided both extremes. Episcopius addressed the synod with these words: “We… have not sought anything else than that golden liberty which keeps the middle road between servitude and licentiousness.” Pelagian doctrines, he suggested led to servitude. The orthodox (Calvinist) doctrines led to licentiousness. But he and his friends had found the perfect middle road. Of course this was dishonest. 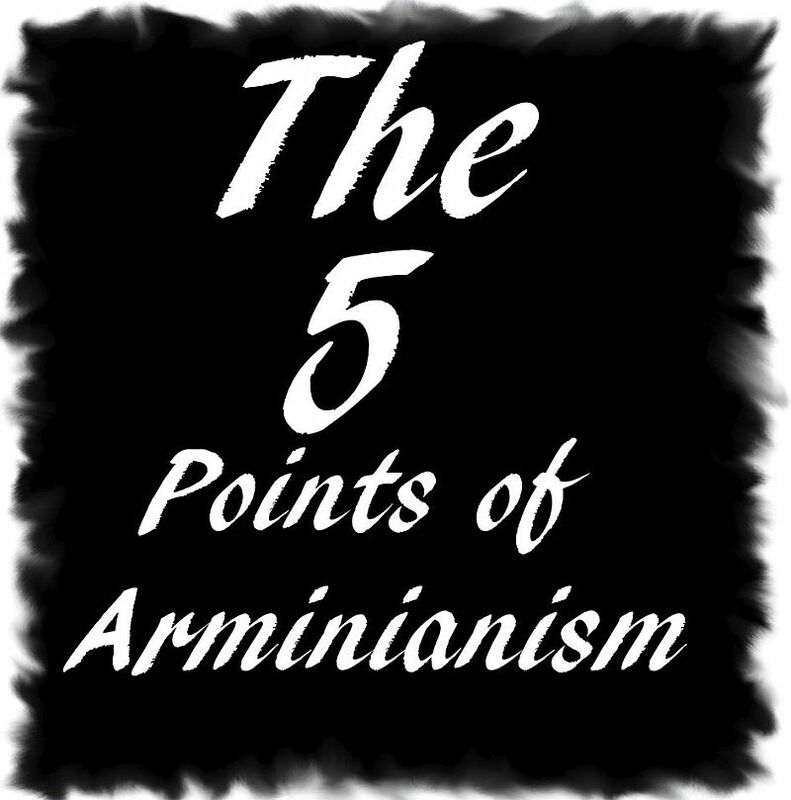 The Arminians themselves were the extremists, bringing in novel and dangerous views. But they wanted to present the issues in such a way that their opponents would seem to be the extremists and that they themselves would seem balanced. Clever debaters use this trick all the time. And we must learn to recognise when it’s being used. Take the example again of charismatic gifts – tongues, prophecy, etc. Some charismatic leaders like to give the impression that their view is the mainstream position. On the one side, they say, are the extremists who say that all real Christians speak in tongues. On the other side are the cessationists – extremists who say that no-one today has a gift of tongues. And that means that their own teaching – the view that some Christians speak in tongues – is the moderate, centre-ground position. But of course it’s not true. The mainstream position, held by the great majority of Bible-believing Christians all down through the centuries, is that the gift of tongues was a gift for the apostolic age, and has long passed away. Anyone who suggests that Christians today should speak in tongues is an extremist following a novel and dangerous teaching. (4) The false teachers appeared to be spiritually minded and godly men. As Episcopius addressed the Synod, he broke out into prayer. “Dear Jesus, from thy throne, how much hast thou heard or seen against us, simple and innocent people…” It was hard for the gathered listeners to remember that this “simple and innocent man” had been systematically breaking his vows and concealing from questioners what he had been privately teaching his students! They soon realised however that they were dealing with a clever and devious man. When Episcopius had finished his opening address, he was asked by the President of the synod for a copy so that it could be considered more carefully. He replied that his copy was not neat enough to be read by others. It took a week before he was willing to hand over a copy – and then the readers found that he had changed it in significant ways! The New Testament writers warned their readers often that false teachers might appear to be the most spiritual of men, full of fine and gracious words, having the appearance of godliness but denying its power (2 Timothy 3:5). That warning still needs to be heeded today. (5) The false teachers tried to capture the minds of men who were preparing for the ministry. That was their strategy: to gain positions of influence in the universities which trained men for ministry in the churches. And that has been the strategy of false teachers again and again. Rather than preaching their novel views openly in the churches, they teach them privately in university departments, seminaries, Bible-colleges. Many of the students they teach will be young, open-minded, ready to explore new ideas, ready to be impressed by the scholarship and skill of their teachers. The false teachers have two or three or more years to shape the minds of their students, a captive audience. How careful churches need to be before exposing their young men to seminary or Bible-school teachers – even in institutions that have a reputation as being orthodox, evangelical and reformed. How many churches really investigate what is being taught in such establishments before sending their future preachers and teachers there to be trained? Well, this has been a long letter – and perhaps heavier reading than most of my contributions to the bulletin. But it’s dealing with a crucial issue. The New Testament is full of warnings to churches. Again and again, the apostles warned their readers that false teachers will surface and attempt to poison the life of the churches. “Fierce wolves will come in among you, not sparing the flock and from among your own selves will arise men speaking twisted things to draw away the disciples after them. Therefore be alert!” (Acts 20: 29-31). Few churches escape such attacks. It is more than likely that we will face them at some point. The leaders of those Dutch churches four hundred years ago were prepared when the crisis came. Will we be ready when our time comes? May God guard this church.